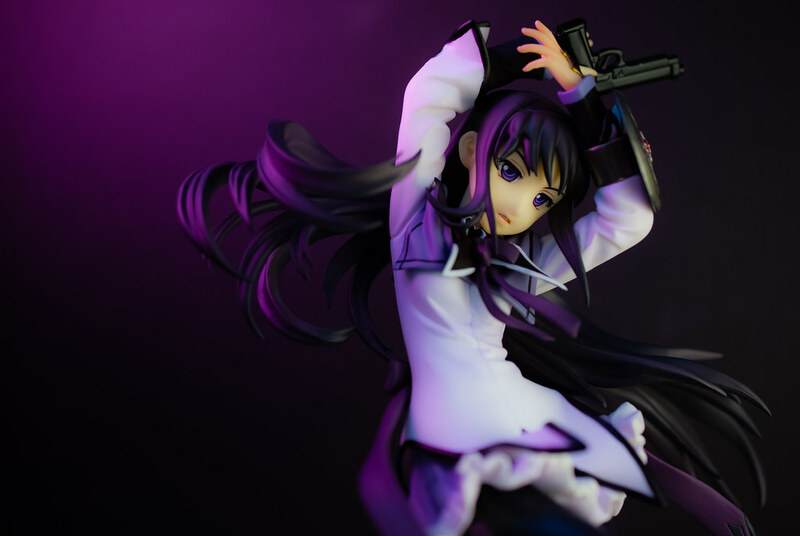 Gift's Akemi Homura - She is just so cool! Hello folks, once again it has a been a while hasn't it? I been wanting to sit down and do this photoshoot for a couple of weeks now. I did try shortly after I received the figure but alas my original idea ended up in failure so instead there is the always the ever present “Plan B”. 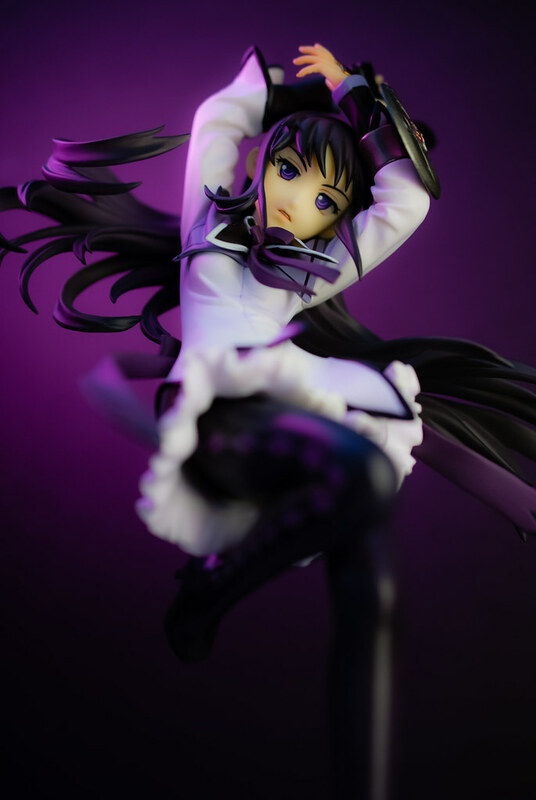 Without much further ado I present to you the super cool Akemi Homura by Gift from the ever so popular franchise of Magical Girl Madoka Magica. Given it’s popularity I was expecting everyone, and when I say everyone I mean EVERYONE, to jump at the chance to make some “easy sell” figures based on the characters. Except that no one really did except mainly for Good Smile Company and the ever present Wave Beach Queens line. Where was Ater, Kotobukiya. Max Factory? This kinda felt like it would lead to something akin to everyone making a Saber, you can never have enough Saber figures in the world apparently, yet only Good Smile Company came forward with proper scaled figures of all five girls. Did they manage to secure an exclusivity deal or something? Usually this would have been fine, Good Smile Company is Good Smile Company after all and they make some very nice figures overall. Except that they chose to base them on the most boring piece of artworks available. All five girls are pretty much just standing there unlike say the Bakemonogatari figures which were also based on different artworks where it nicely reflected certain aspects of each of the characters. In the end I ended up finding a few garage kits way more interesting than the figured available for purchase. This is where this figure comes in, this was actually one of those garage kits. Every once in awhile, I see some fairly nice garage kits and I think about how nice it would be to have a nice proper PVC version of it. Luckily for me Gift came to the rescue! This is actually the second time this has happened, a few years back there was this garage kit I really liked of Reimu and Gift went and released it as a PVC figure shortly afterwards. 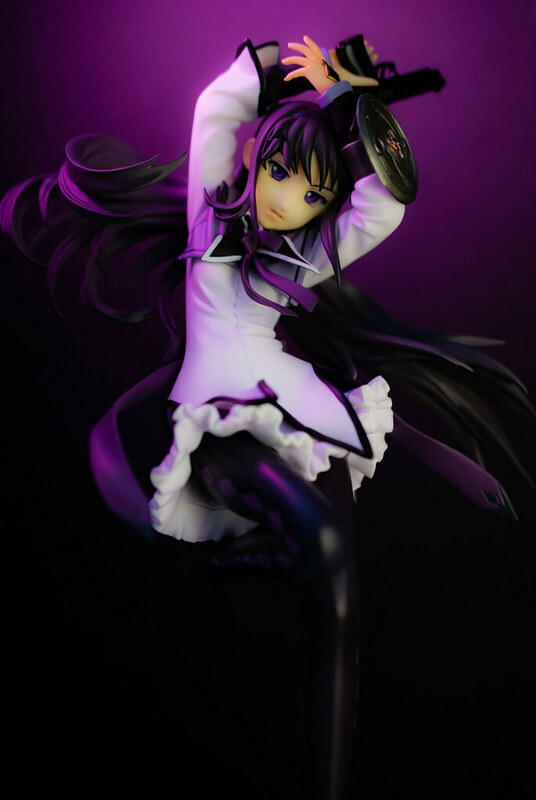 This nice looking Homura is sculpted by Toda Satoshi from Gift, probably most known for his line of Saber figures featuring his distinct style. Which for some it has been a cause of discord due to his renditions in a stylized manner for his Saber faces. As for me, it has been pretty hit or miss, I liked his Lily Saber for example but didn't care much for say his original Saber. Quite obviously his rendition of Homura was a hit for me. 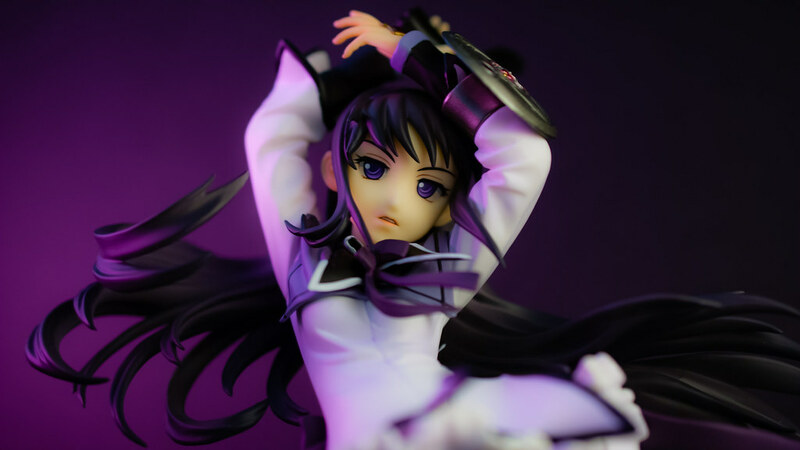 At first when I was looking at the original garage kit I wasn't so sure, I liked the pose of the figure overall but when looking on her face something felt off. After seeing the actual PVC release though those feelings went away I was all in and hit the pre-order button. I wonder if there was some small minute tweak that made everything just look right for me. So, let's address the elephant in the room. This figure is of course different from Aoki Ume's lovely wide fade designs as seen in the show and promotional art and as mentioned above carries Toda Satoshi's own style. Short answer, I like it. To my eyes what this ends up doing is giving Homura a more adult appeal, almost if I was looking at an older Homura. I like the style of the eyes, the shading they have and the eyelashes. Plus I think the colored lips with a bit gloss are nice touch not normally seen in figures. 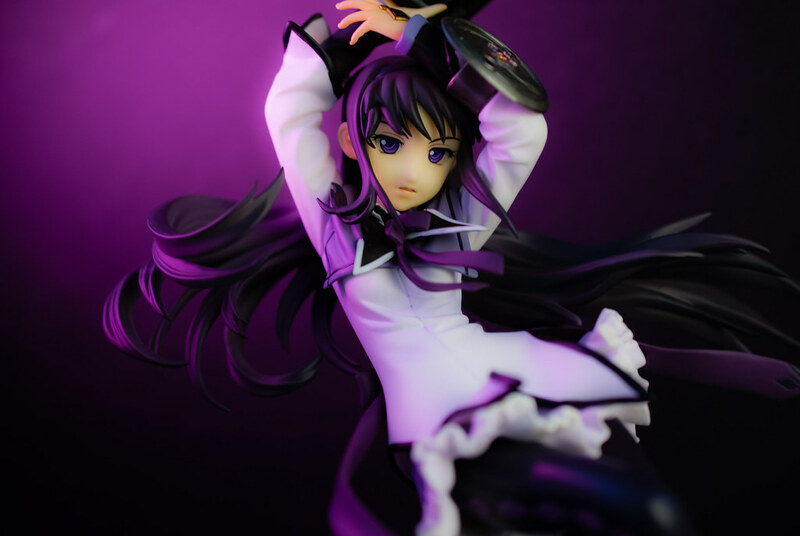 I found the pose to be really neat, you have Homura as if she was dropping down from a greater height and because of that you get a lot of cool movement going on with figure. All the different elements of Homura's magical girl outfit, the skirt, the ribbon in the back of her skirt, her collar and neck ribbon all add a lot of nice details to convey movement. Add to that her flowing hair and you really do get a nice dynamic figure. I love dynamic figures, I always find it add a nice little extra touch of figure goodness. Gift did a fairly nice job with the hair, the different strands of Homura's long hair each moving in a manner befitting of the apparent action really turned out great. 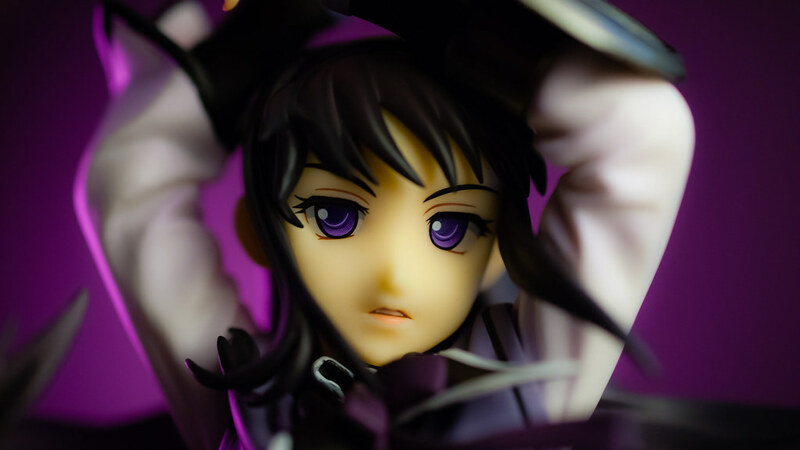 Quite importantly seam lines on the hair also seems pretty much non apparent an area where I seen even the likes of Alter or Good Smile Company falter sometimes. To close it all off you get the surprisingly appealing base to me. After my last disappointment with Tenshi's cheesecake base I'm glad Gift took a way better route and link the base with the character. The pattern on the base is reminiscent of the "time traveling" scene during episode 10 of the show where we see Homura go back in time. Pretty neat stuff if you ask me. 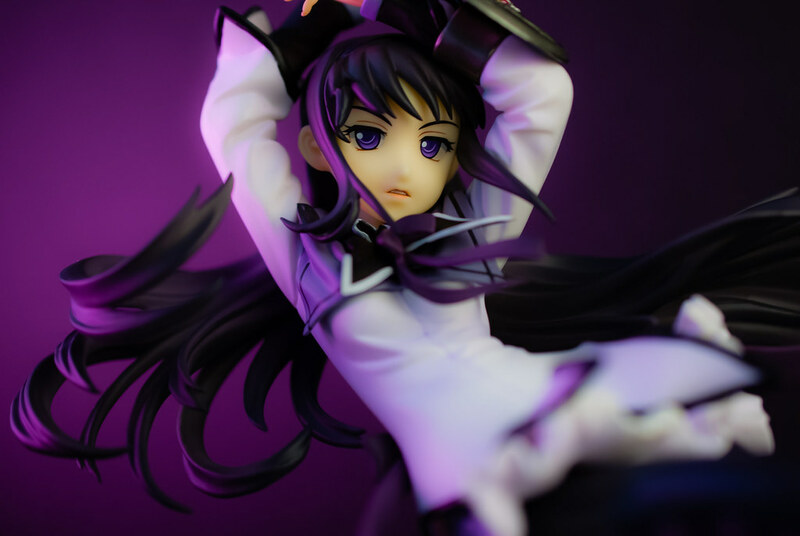 Given her pose and base this figure really does make it seem Homura is the girl who leapt through time! Detail on some of the important bits like the bracer and handgun are not too bad. 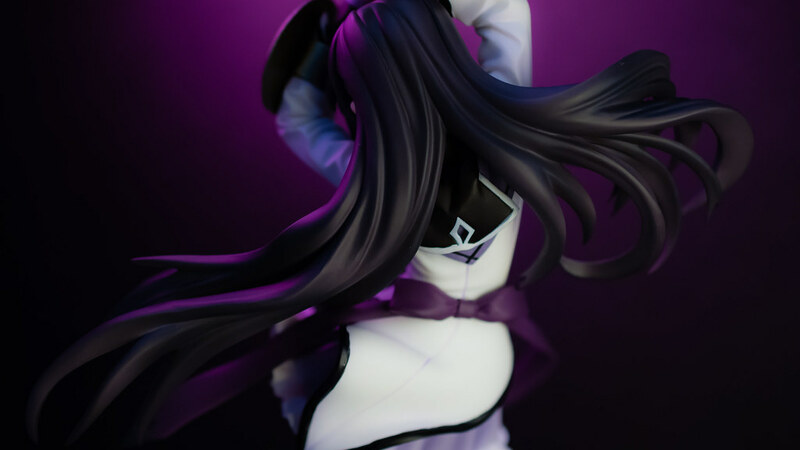 Unlike the figma version this Homura does have a nicely detailed bracer with all the right colors. I'm not too hot on the actual part with the mechanism though, while bits of stuff is sculpted the painting makes it all a big messy blob. A shame considering the painting was perfect on the rest of the figure. 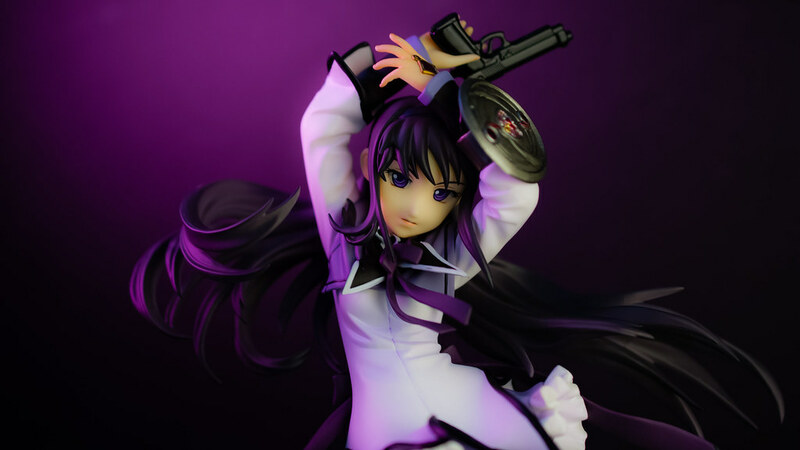 The handgun looks the part, just the way the Beretta handgun Homura uses to make some Swiss cheese out of Kyubey did in the show. 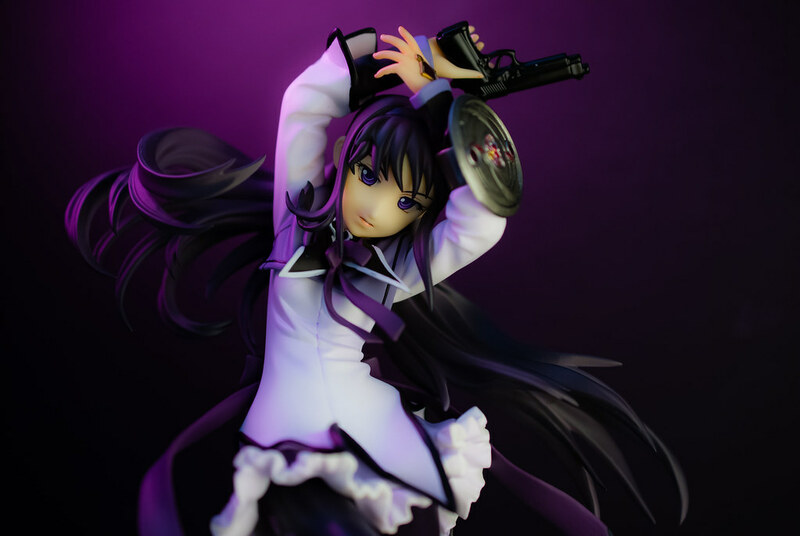 Interestingly enough I liked how her finger is not actually on the trigger, Homura practices proper gun safety! Overall I think Gift did a very good job with this figure. This is the second time I get to sit down and shoot one of their figures, the first was the previously mentioned Reimu, and both times it has a been a pleasant experience. I still got their giant loli Nanoha boxed and look forward to taking pictures of her. As things stand I will definitely buy more Gift figures if any that tickle my fancy show up. Before I finish I want to talk about the pictures. As I mentioned in the beginning this is actually "Plan B", the first plan didn't turn out as a I wanted. I was originally planning to do something similar to the "time travelling" scene to match the base. However, I couldn't quite get the effected I wanted with the background so I ended up scrapping that idea. 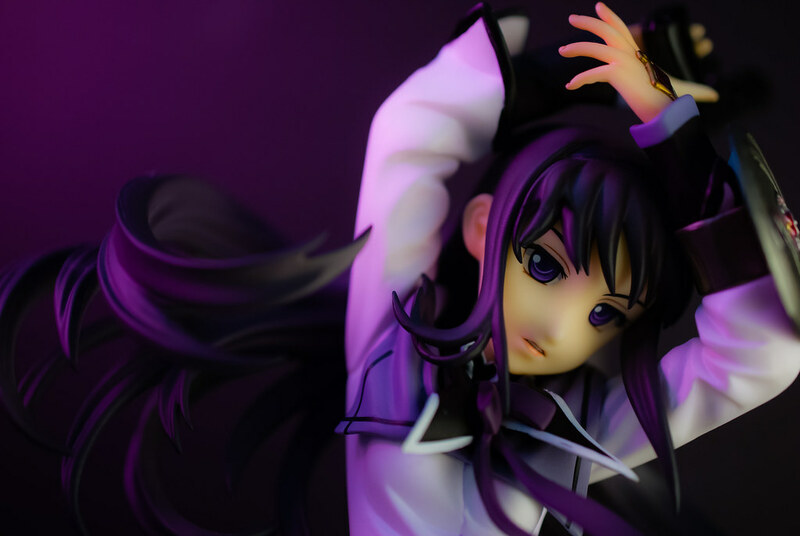 That's when I thought, Homura is like all dark and edgy so perhaps dark background will do. 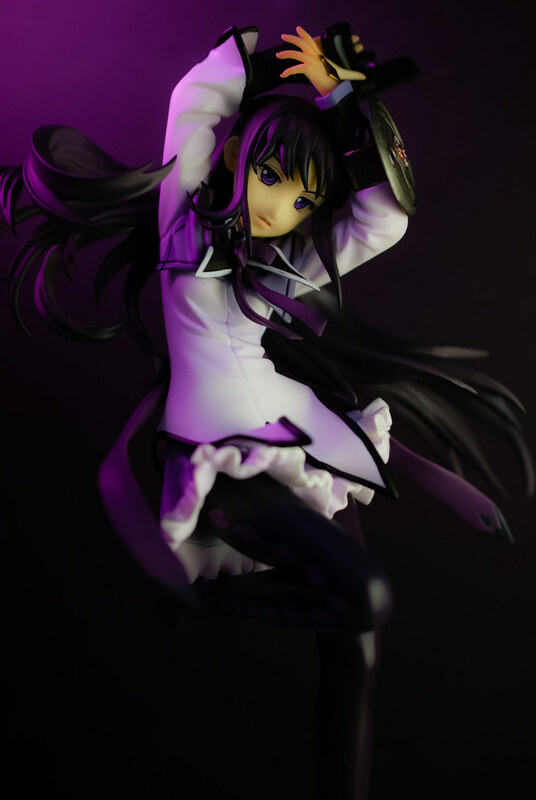 Except that Homura also happens to have a darker color scheme with her long black hair. What ended up happening was that the hair would simply ended up blending with the equally black colored background. So, I researched on how to shoot black objects in front of black backgrounds. I found a couple of ways to do it, both involving the use of colored gels to simply add some color. 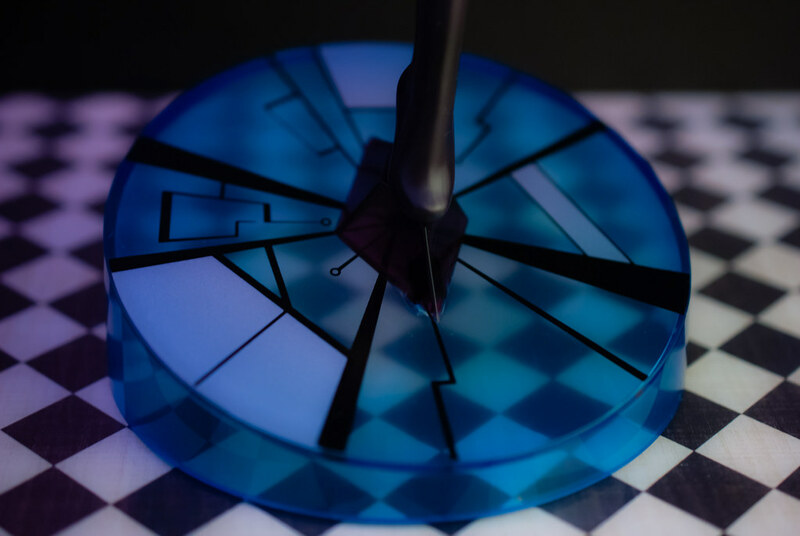 One was to use a rim light with a colored gel to make the edges of the object stand out. The other was to point it at the background to add some color to separate the object of interest from the background. I did exactly just that. 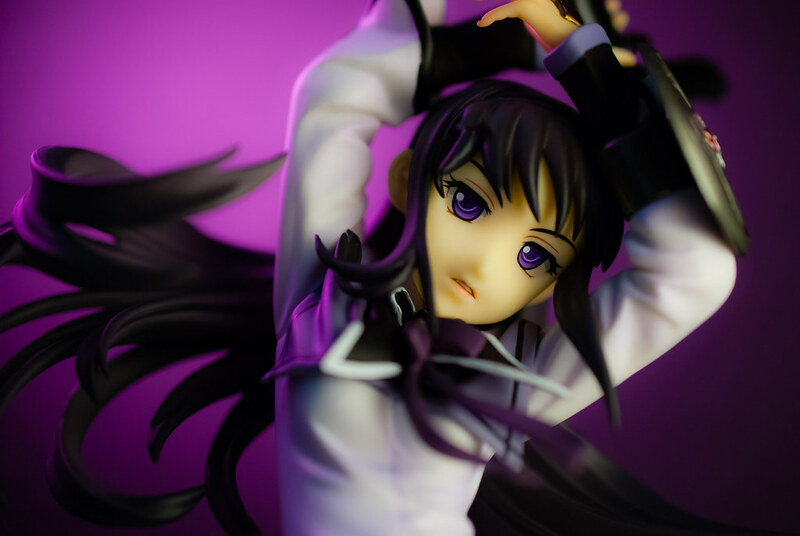 I had my key light aimed at Homura as usual, then a second light this time pointed at the background behind her to both illuminated the background and to provide a rim light for her hair. 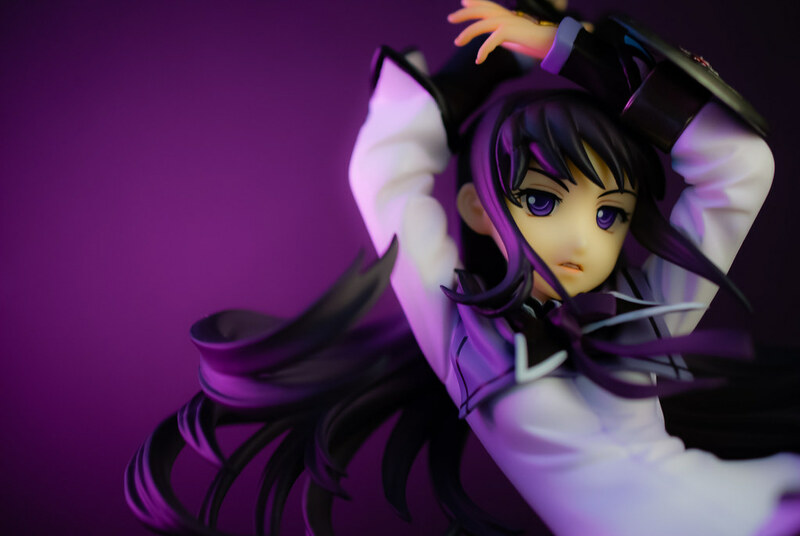 I used a combination of two "gels" on that second light to provide the signature purple color associated with Homura. You can see a picture of this set up right here, very simple to do, very simple to recreate. I think this is something that I will probably revisit in the future, I already have an idea in mind for a future photo shoot where I might reuse it. What do you guys think? I'm quite happy with how these pictures turned out for my first attempt. I look forward to giving it another go and refining the lighting. Alrighty then, until next time!